India’s E-commerce market is buzzing with startup activity as Internet usage skyrockets. But, as the market becomes increasingly saturated with startups, many Indian entrepreneurs say that they find themselves in the middle of a tech bubble, and that it’s close to bursting. We spoke to Quantified Commerce, a vertically integrated company within the beauty E-commerce market, on how building a bootstrapped company is the way to go if you’re trying to build a sustainable business. There was a dot-com bubble in the United States in 1997, which burst between 2000 and 2002. The rate of Internet usage was rapidly growing in the U.S., as it is now in India. This lead entrepreneurs and venture capitalists to see enormous opportunity in the market. Sadly, thousands of startups overestimated that opportunity. Not many fledgling dot-coms survived the burst … except of course Amazon and eBay. Since the situation in India so closely parallels what happened in the U.S., entrepreneurs fear a similar fate. A recent report that surveyed 170 entrepreneurs across 15 industries revealed that 65% of them feared that India was at the center of an expanding tech bubble. Despite many thinking that it is in the center of a bubble, within the last two years, over 40% of Indian startups have shut down. That’s about 1,000 startups that closed up shop. Most cited a lack of funding. But, their failures may be because of operational inefficiencies and touting a high gross merchandise volume (GMV). GMV is essentially a vanity metric. It is flaunted as a measure of success and often talked about like it’s the same as revenue. The GMV is the sale price charged per item multiplied by the number of items sold. The only revenue is the commission they make off the sale of the item. Many of these failed companies were relying on GMV instead of considering cash flow and working capital. The E-commerce sector was among the hardest hit. Online apparel retailers like Fashionara and DonebyNone were two major casualties of the segment. But, despite the failures of some, there are still ample opportunities for many. While China is steadfastly holding the number one position for the largest E-commerce market in the world. India is coming up as the fastest growing. The market is expected to grow 1,200% by the year 2026. This presents itself as an irresistible opportunity for the entrepreneurially-inclined. The fastest-growing segment is beauty and wellness, where Quantified Commerce is deeply-rooted. 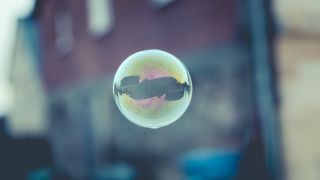 While a VC-funded bubble in India is still speculative, there are things that a startups can do to make sure they remain stable if the market takes a sudden downward turn. Basing growth on real metrics and not vanity metrics, and making your company as lean as possible will help startups survive a potential burst.